Playing with gelatinous goo is fun. Add some wonky sounds to the mix, and I may just be captivated for hours. And that's exactly what Noisy Jelly offers. Although it's advertised as a game, Noisy Jelly is more of a cross between a home science kit and a musical instrument. 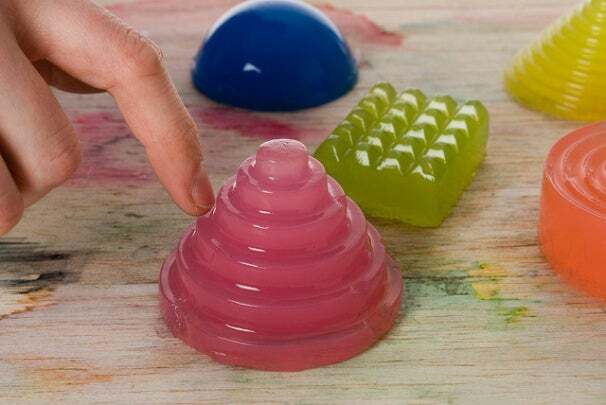 The kit comes with agar agar powder, some dyes and a variety of moulds that you use to make a series of colorful jellies of different shapes. The game board is a thin sheet of wood on top of metal foil that is hooked up to an Arduino board that runs what's known as #capcence lib, which allows it to function as a capacitive sensor. The game board can sense when you touch the jelly and translate your touch into a sound. The sound varies with the pressure of your touch, where you touch the jelly, the salt concentration of the jelly, and its shape. Noisy Jelly is a creation from Marianne Cauvard and Raphael Pluvinage, students at Ensci - Les Ateliers. You can check out the jellies in action in the video below. Just watching the video makes me itch to play with the jellies!